There are some important events happening in Ontario, Canada. The street is filled with sights, sounds and activities for everyone to enjoy. The Business Improvement Area is committed to raising funds in support of local charities, while also providing more than 50% of the funds necessary to stage the Taste of Lawrence Festival every year. Without the hlep of the community and corporate sponsors this event would not be possible. 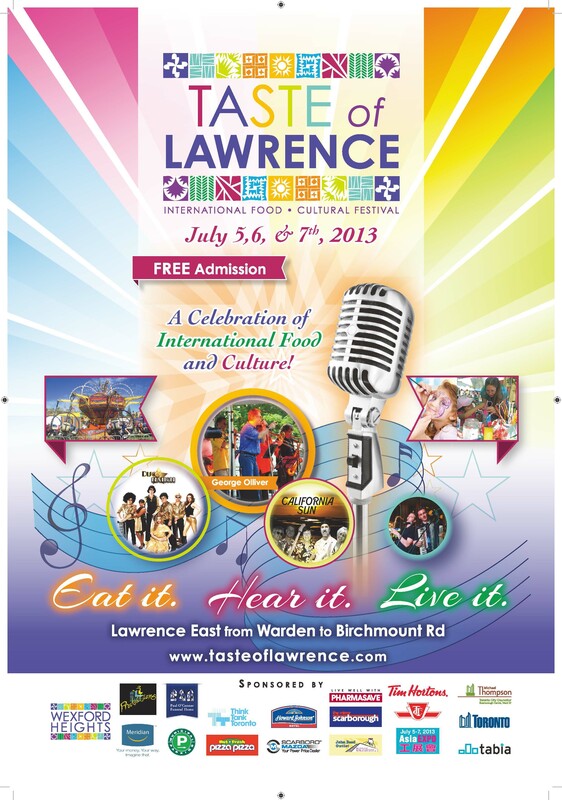 Taste of Lawrence 2013 Festival is a celebration of international food and culture. This festival attracts over 50,000 people from communities throughout the Greater Toronto Area and beyond. Taste of Lawrence Festival is a street festival celebrating the cultural diversity of Toronto and the GTA by showcasing the unique cuisine, music, performers, vendors, retailers and community groups. Please click here for more info and the schedules of performances and events. The hottest DJs – with a side of your favourite fried gourmet cuisine. Please click here for more info and schedule of DJ Deep Fried Fridays events. Benvenuti festival is located in the neighbourhood along St. Claire Ave West. 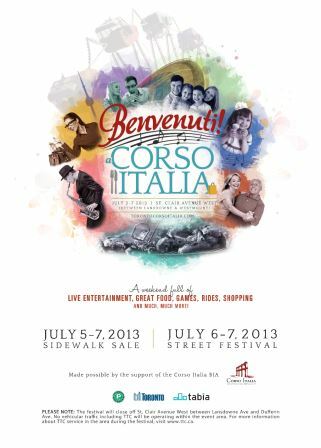 “Benvenuti!” – the Italian word for welcome – is the Corso Italia Annual Street Festival. Enjoy the live entertainment at the Benvenuti Street Festival featuring amazing local talent, cultural music and Juno award winning artists. There’s also a family friendly midway with games and rides. New this year, Steam Whistle will be on site with a beer tent. Please click here for more info and the schedule of performances at the Benvenuti Festival 2013. The 2012 Ottawa Fishing Festival was held at Brewer Park during the Ontario license-free family fishing week. Ottawa Fishing Festival has partnered with Angels of Hope, a charity foundation that is dedicated to raising funds for brain cancer research. Canadian residents can fish licence-free in Ontario from July 6-14 as well as enjoy the province’s beautiful lakes and rivers. If you fish without a licence during Family Fishing Week, you must follow the conservation licence limits set out in the 2013 Recreational Fishing Regulations Summary. Ontario is home to 160 species of freshwater fish in lakes and rivers across the province. Plan your fishing trip from start to finish with Ontario’s Fish ON-Line tool. For more information on fishing events, visit the Ontario Federation of Anglers and Hunters. 2013 Urban Fishing Festivals in the Greater Toronto Area. Celebrate Family Fishing Festival at High Park and Toronto Island. This weekend event is a celebration of fishing in natural places and will include family games, face painting, environmental education and lots of fishing. Residents can take part at Grenadier Pond in High Park (1873 Bloor St. W.) on Saturday, July 6 from 10 a.m. to 3 p.m. and at Centre Island on Sunday, July 7 from 10:30 a.m. to 1:30 p.m. Please note: registration is required for the Centre Island event. Don’t forget to bring your own rod and reel. Tuesday, Wednesday & Friday: 10 a.m. to 4:30 p.m. The Layers of Leaside exhibit, organized by the Leaside 100 Committee and presented by Todmorden Mills Heritage Site, celebrates the founding and development of Leaside, a thriving midtown community. A video slide show, Leaside – Then and Now, will run during the exhibition. The video slide show was created by Anna-Louise Richardson of Tree of Life Video. Please click here for more info about Layers of Leaside exhibition. Councillor Adam Vaughan (Ward 20 Trinity Spadina) will join community representatives for a lane-naming ceremony to honour Albert Jackson. Albert Jackson was Toronto’s first black postman who lived in Harbord Village on Brunswick Avenue. Pizza in the Pits Tree Tour is part of the David Suzuki Foundation’s Homegrown National Park Project. Learn about the ecology of the area and how to identify different types of trees as well as what local residents are doing to improve the park. The tour ends at the second Homegrown Pizza in the Pits night at the wood-burning oven in Christie Pits. 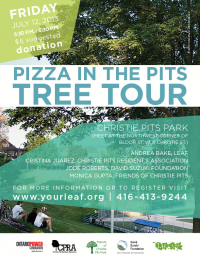 Please click here for more info and registration for the Pizza in the Pits Tree Tour. Greg Johnston, Toronto and Region Conservation (TRCA). Join LEAF, Toronto and Region Conservation (TRCA) and local volunteer group Highland Creek Green Team on a guided walk of the tree canopy along Highland Creek in Morningside Park. Explore this quiet valley and its interesting waterway. Learn about the history of the valley, the benefits our urban trees provide, as well as free and subsidized planting programs to help residents take action at home. The Morningside/Highland Creek Tree Tour is on paved path, mostly level with one hill to get into and out of the ravine. Please click here for more info and registration for the tree tour. Please click here for more info and the schedule of performances by Ricardo Barboza and his band. Please click here for more info and the schedule of performances by The Toronto All-Star Big Band. TTC’s image: Late Sunday Opening of Portion of Bloor- Danforth Subway Line. Portion of Toronto Transit Commission (TTC) Bloor-Danforth Subway Line: Late Sunday Opening on July 7, July 14 and July 28, 2013. Subway service at Bay, Bloor-Yonge, Sherbourne, Castle Frank, Broadview and Chester stations will begin at 1:00 pm. Eastbound trains from Kipling Station will turn back west at St George Station. Westbound trains from Kennedy Station will turn back east at Pape Station. For an accessible subway connection, buses will also be provided between St George Station and Main Street Station. Taste of Lawrence’s Road Closure. Lawrence Avenue from Warden Avenue to Birchmount Road, will be closed on Friday, July 5 at 10 a.m. to Sunday, July 7 at 11:59 p.m.
Benvenuti Corso Italia’s Road Closure. St. Clair Avenue from Lansdowne Avenue to Dufferin Street, will be closed from Saturday, July 6 at 5 a.m. to Monday July 8 at 2 a.m. for this event. Festival of South Asia’s Road Closure. This is an update to my previous blog You’re Invited: Summer in the City of Toronto Events July 2 – August 29, 2013. Gerrard Street East from Coxwell Avenue to Glenside Avenue will be closed in both directions from Saturday, July 6 at 10 a.m. to Monday, July 8 at 2 a.m. Please click here for more info about road restrictions. Three special events this weekend will involve road closures. Residents and visitors are encouraged to come out and enjoy these events. Businesses in the areas affected are open to pedestrian traffic but some roads will be closed to vehicles. Those who need to drive in the general vicinity of special events should allow extra time to get to and from their destination. More information is available at http://www.toronto.ca/torontostreets/.